Another set from Well-DressedSims brought out, dusted off, and finished due to a post from Kiri (funny how that happens...) The original set can now be found at SimsCave in case you would prefer to have it instead. I've slaved all the wood pieces in the set to the bed and the pillows to the reading chair. If I'd thought about it sooner, I could have slaved it all to the chair (or the bench), but I wasn't willing to go back and redo it. The end table fabric is slaved to jonesi's blanket, so make sure you have an updated version that supports transparency and an invisible recolor (get them here if you need them). 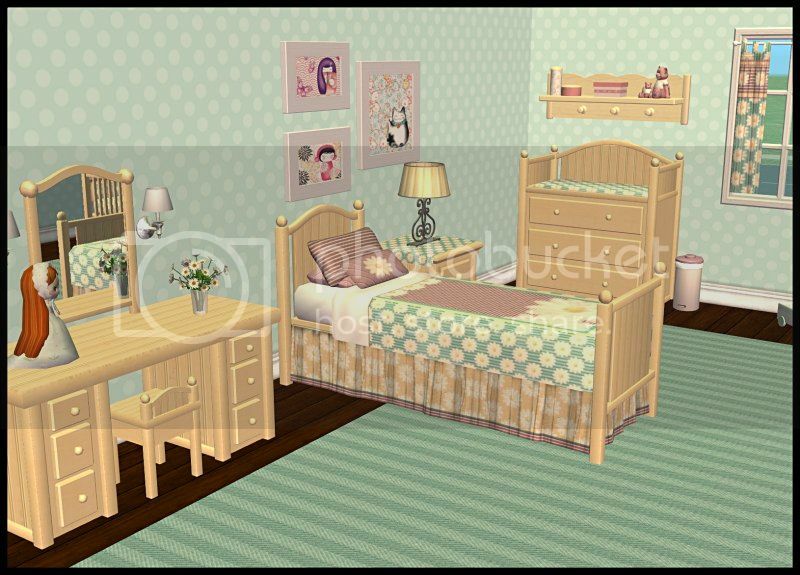 The wood shown here is WDS's original yellow recolor- included- the mesh set is bright white with pink cushions. Remove the original meshes and substitute mine- they use the same GUIDs so you can't have both at the same time. Oh Kate! You are wonderful!! Thankyou so much for doing this. Yes, you can post those links here. I'll also put your link to the original meshes at SimsCave (I'm glad to know they are archiving them) at the top in case anyone would like the originals instead of these. Yeah I know! Why do you think I have 15 Fabric textures and 25 Woods (-6 for the ones you did) ready for it! Not all the SimsCave links are work anymore, and some of them are only the pay stuff, so after I've rebuilt it on my PC, I'm going to offer SimsCave to update the links with the complete lot. Thanks so much Amythestfenix for all your hard work I love it!! Kate, I love this room, and with Jonesi stuff, I can hardly stop my mind from spinning with possibilities! 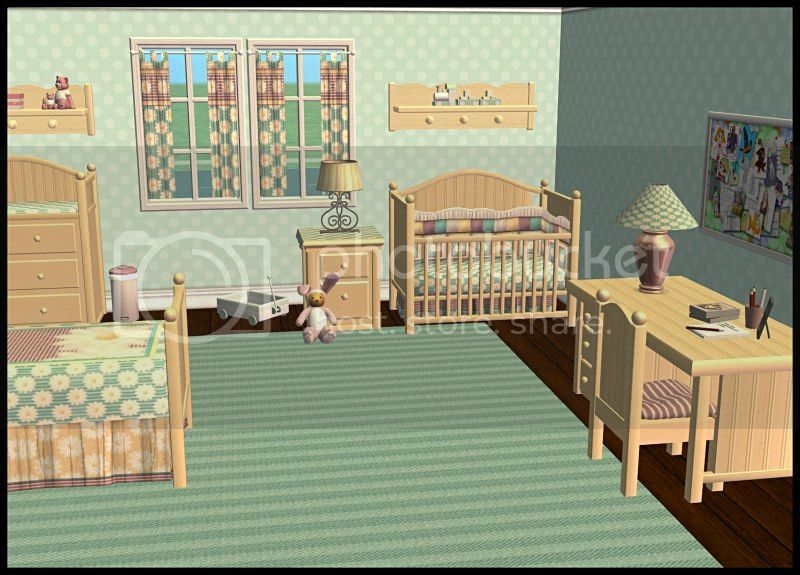 Finally started posting up the Nursery Recolours for this set. I have credited you and linked to this post for the meshes. Thankyou again for doing this! These are adorable and my sim kids will be delighted to have them You are always welcome to include my meshes if you'd like to do so. Thanks Kate, I think I might as I have confused pru again, although I was doing my best not to. I have loved this set for a long time! I think its great the creator gave you permission to slave them! Do you have future plans of slaving the reading chair, desk chair, bench, and the end table to the crib bedding and the regular bedding? It's actually Brianna's creation, and I made attempts to contact her without success. I'm of the opinion that if they had remained contactable, I would have abided by whatever their wishes were, and if they ever return and express a wish, I will abide by them again. However while they are not contactable, and they do not have a site anymore, that keeping their sets and memories are alive are ok. The Pillows aren't really suited to matching with cribbing and bedding because of the shading overlays that you would need to create. I've looked into it, but came to the conclusion that the pain to do it, wouldn't be worth it as it would provide a not-good-enough object in my eyes. Also especially for the bench, you'd lose the ability to have different cushion recolours. Which is a lot of the reason why I love the bench. One of my favorite sets and unfortunately with all the new textures it didn't look so good AND the recolors made it take up so much space. Thank you for all the hard work!